Finger-tracking is usage of bare hand to operate a computer in order to make human-computer interaction much more faster and easier. Fingertip finding deals with extraction of information from hand features and positions. In this method we use the position and direction of the fingers in order to get the required segmented region of interest. Finger pointing systems aim to replace pointing and clicking devices like the mouse with the bare hand. These applications require a robust localization of the fingertip plus the recognition of a limited number of hand postures for “clicking-commands”. 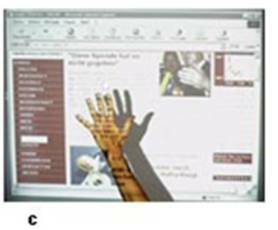 Finger-tracking systems are considered as specialized type of hand posture/gesture recognition system. 1) Only the most simple hand postures and recognized. 2) The hand usually covers a part of the on screen. In finger –tracking systems except that the real-time constraints currently do not allow sophisticated approaches such as 3D-model matching or Gabor wavelets. The FingerMouse system makes it possible to control a standard11 mouse pointer with the bare hand. If the user moves an outstretched forefinger in front of the camera, the mouse pointer follows the finger in real-time. Keeping the finger in the same position for one second generates a single mouse click. An outstretched thumb invokes the double-click command; the mouse-wheel is activated by stretching out all five fingers. Similar to the popular touch-screens, projected screens could become “touchable” with the FingerMouse. Several persons could work simultaneously on one surface and logical objects, such as buttons and sliders, could be manipulated directly without the need for a physical object as intermediary. The second system is built to demonstrate how simple hand gestures can be used to control an application. A typical scenario where the user needs to control the computer from a certain distance is during a presentation. Several projector manufacturers have recognized this need and built remote controls for projectors that can also be used to control applications such as Microsoft PowerPoint. Our goal is to build a system that can do without remote controls. The user's hand will become the only necessary controlling device. 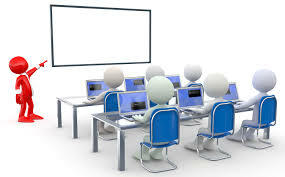 The interaction between human and computer during a presentation is focused on navigating between a set of slides. The most common command is “Next Slide”. From time to time it is necessary to go back one slide or to jump to a certain slide within the presentation. The Free Hand Present system uses simple hand gestures for the three described cases. Two fingers shown to the camera invoke the “Next Slide” command; three fingers mean “Previous Slide”; and a hand with all five fingers stretched out opens a window that makes it possible to directly choose an arbitrary slide with the fingers. The BrainStorm system is built for the described scenario. During the idea generation phase, users can type their thoughts into a wireless keyboard and attach colors to their input. The computer automatically distributes the user input on the screen, which is projected onto the wall. The resulting picture on the wall resembles the old paper-pinning technique but has the big advantage that it can be saved at any time. For the second phase of the process, the finger-tracking system comes into action. •	The system works on light background with small amounts of clutter. •	The maximum size of the search area is about 1.5 x 1m but can easily be increased with additional processing power. •	The system works with different light situations and adapts automatically to changing conditions. •	No set-up stage is necessary. The user can just walk up to the system and use it at any time. •	There are no restrictions on the speed of finger movements. •	No special hardware, markers or gloves are necessary. •	Multiple fingers and hands can be tracked simultaneously.